LONDON, England -- Britain's elite wrestling centre in Salford has seen a spate of marriages between imported Ukrainian wrestlers and British-born competitors. Leon Rattigan, a British heavyweight, lifts his new bride, Ukrainian Yana Stadnik, a fellow wrestler who is seeking to compete for Britain at the London Olympics. It must be all that grappling they do on the wrestling mats. A series of eastern Europeans, invited to the UK to help to train local wrestlers ahead of the 2012 Olympics, have ended up marrying British-born competitors. The phenomenon suggests that the community of wrestlers, who train six days a week at the British Wrestling Association's academy in Salford, are in somewhat closer holds than fans of one of the oldest of the Olympic sports ever realised. It is understood that as many as four Ukrainian men have married young female wrestlers whom they met at the academy, where the women had been sent to improve their skills. In the most recent marriage, a Ukrainian woman, who is one of the best female wrestlers in the world, has married a British champion to form Team GB's golden couple. The decision to import eastern European wrestlers has caused huge ructions in a sport which has received about £3.5 million ($5.5 million) in funding from UK Sport. Some of the Ukrainians were brought over as training partners and have since stayed, obtaining British passports in the process – allowing them to compete for Team GB in the London Olympics. Critics claim that the policy of effectively buying in foreign talent, following the appointment of a Ukrainian coach almost ten years ago, has had a damaging, demoralising effect on Britain's home-grown athletes. Having a British spouse can speed up a foreign national's application for a UK passport by up to two years. There is no suggestion that any of the foreign wrestlers were motivated by this. Two of the Ukrainian men - Myroslav Dykun, who last year won a Commonwealth Games gold medal for England, and Oleksandr 'Sasha' Madyarchyk - were due to compete this weekend for Britain in a test event at the Excel exhibition centre in London, host venue for the Olympic wrestling. Madyarchyk remains happily married while Dykun's marriage is understood to have ended in divorce. Both men are hopeful of wrestling for Britain at the Olympics. Two other eastern Europeans, both believed to be Ukrainian, who do not feature in the Great Britain elite squad also married young British women who had been training at the national academy. One of the men was Anatoliy Porogovskyy, who came second in the English championships in 2009. Britain's best hope for a medal, Yana Stadnik, a European silver medallist, last year married Leon Rattigan, a British heavyweight wrestler. 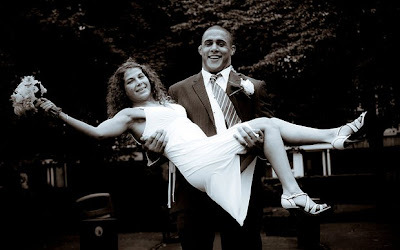 The wedding was not made public and was witnessed by Malcolm Morley, the chairman of the British Wrestling Association, and Yvonne Ball, the association's administrator. Stadnik, 24, said last week: "I have fallen in love four years ago with Leon." "Most of the time we spend training but the small time we have together [outside of training] we like going to the park. We have also been to Blackpool, Stonehenge, Liverpool." Stadnik is struggling to obtain a passport in time to compete at 2012 even though she has wrestled for Britain at other major tournaments. The Olympic rules are stricter. The marriage to Rattigan, who is a year younger, was largely kept secret with no public announcement. The Home Office and immigration lawyers confirmed the marriage would not help Stadnik get a passport. She is instead relying on the discretion of Theresa May, the Home Secretary, who is being urged to speed up Stadnik's request for citizenship. If she fails to get her passport, then hundreds of thousands of pounds spent on her in the past five years will have been wasted. A British Wrestling spokesman said last week: "If anybody is implying it has all been set up, that is ridiculous. It is just laughable. These claims threaten Yana's chances because Theresa May will look at it and think 'what a bloody mess'. All the negative publicity could possibly stop Yana competing at the Olympics." "Leon is a very private person and didn't want his social life made public. He didn't want it mentioned." Colin Nicholson, chief executive of British Wrestling, said: "These wrestlers have been in the country many years and have given great service to British wrestling and if they choose to naturalise, the British Wrestling Association will support them in their aspirations." Roy Wood, a wrestling coach in Wigan, said he would no longer send young women to the academy in Salford to improve their wrestling because he claimed they kept getting married to Ukrainian men and then dropping out of serious wrestling. Stadnik and her friend and compatriot Olga Butkevych are the only women in the elite squad. Mr Wood said: "I regret sending any female wrestlers to the academy. I got them to a decent level of wrestling and sent them there thinking it would improve them. It has done completely the opposite." "I am not happy with the way they have been treated. They were impressionable young girls." The president of FILA, the world governing body of wrestling, on Friday criticised the British policy of recruiting athletes from overseas. Raphael Martinetti, who is in London for this weekend's Olympic test event, said he opposed British Wrestling's recruitment policy and insisted the sport needed home-grown wrestlers to prosper in the future. "Athletes have come from Ukraine and other countries, but this leaves no legacy from the Games," said Mr Martinetti. "I think it's no good for the country."